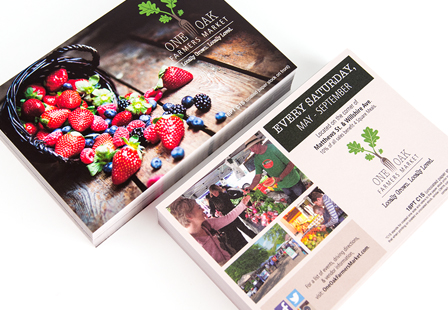 Make a powerful first impression and demand attention with our C1S postcards. With custom postcards, you can do it all; advertise your business, distribute coupons and announcements, use as appointment reminders cards and more. Use them as photo cards, baby announcements, wedding invitations, holiday cards and so much more. The front is coated, which provides more vibrant colors, while the back is uncoated resulting in duller colors. Additionally, the uncoated side allows you to quickly write on it by pen or pencil without the fear of smudging. Choose from a variety of sizes and printing options to meet your business or personal printing needs. From business marketing to personalized invitations, we’ve got you covered. Please Select 2" x 8" 2.75" x 4.25" 3" x 4" 3" x 5" 3.5" x 5" 3.5" x 8.5" 3.66" x 4.25" 3.67" x 8.5" 4" x 4" 4" x 6" 4.25" x 5.5" 4.25" x 6" 4.25" x 9" 4.25" x 11" 5" x 7" 5.5" x 8.5" 6" x 9" 6" x 11" 6.25" x 9" 6.25" x 11" 6.5" x 9"